With the hot weather of summer tapering off and the cool fall weather rolling in, it’s time to begin installing your landscape. The cools comfortable weather of late summer is when shrubs, plants, and flowers thrive. Landscaping is hard work, so it is important to understand how and when you should install your landscape to ensure your hard work is rewarded with a lush landscape, rather than a dying, brown one. Selecting the right type of plants for the season and deciding on the right time to install them can be a confusing task. Landscaping serves to maximize your home’s curb appeal, so to make sure you achieve that, it is important to understand the facts and the specifics of each type of plant, flower, or shrub you plan to install as well as the ground conditions. If plants receive too much sun/not enough sun or too much water/too little water or are planted in poor soil conditions, your landscaping is likely to fail. Without proper watering or proper planting, most plants will die within a few months of being installed. So, it is important to know the details of all growing conditions in your landscaping beds to help you choose plants that will thrive and require minimal care. Many homeowners begin their planting projects in the spring when the weather is beginning to warm up. Although this is a common time to begin a landscaping project, it is not necessarily the best time to begin planting. The spring season comes with excessive rain, unexpected heat waves and even surprise snowstorms at the beginning of the season. These unpredictable occurrences can place damaging stress on newly installed shrubs, flowers, and plants. If you decide to plant in the later part of spring or summer, your plants will require more attention. The heat and humidity of the summer will also place stress on your shrubs, plants, and flowers. This will require consistent routine watering and extra care to ensure they survive the summer stress. 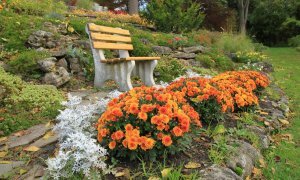 The early fall brings cooler temperatures and a much lower humidity, creating a comfortable environment for both you and your plants, shrubs, and flowers. Installing shrubs, trees, and perennials in the fall will promote a healthier more stable root system, helping them grow strong by the time spring arrives. With a more developed root system, your plants will also hold up better against the stress of the summer. By planting in the fall and knowing the correct way to plant and water your landscape, you can avoid the stress of summer heat and humidity and improve your chances of having a successful and beautiful landscape. As the fall season approaches, you can take advantage of the favorable soil temperatures and ideal moisture conditions that will promote strong root growth and sustain the plants throughout their first year of critical growth. Timing is not the only important factor for a successful landscape installation. Choosing the right plants to install is a crucial factor in ensuring you have a beautifully landscaped yard, rather than a pile of brown, dead foliage. The fall is a great time to plant trees or shrubs because they will establish a strong root system by the time the spring season arrives. Perennials, such as mums or Japanese toad lilies, are also great to plant during this time because they will thrive in the optimal growing conditions of fall and be ready to bud come springtime. You can also divide and replant perennials during this time as long as they are not in mid-bloom. Fall is also a great time for planting a variety of cold tolerant annuals such as Nemesia, Diascia, or the popular flowering cabbage, Osaka. Contact Treesdale Landscape Company today to learn more about our fall landscape installation services and how we can help you find the perfect plants, trees, and shrubs for your fall landscaping projects!